the term of the lease is not fulfilled, I (we) understand that a Termination Fee may apply. Communities no later than ________________________. damage deposit back as possible. and other related turnover costs are complete. their lease expires, whichever is longer. 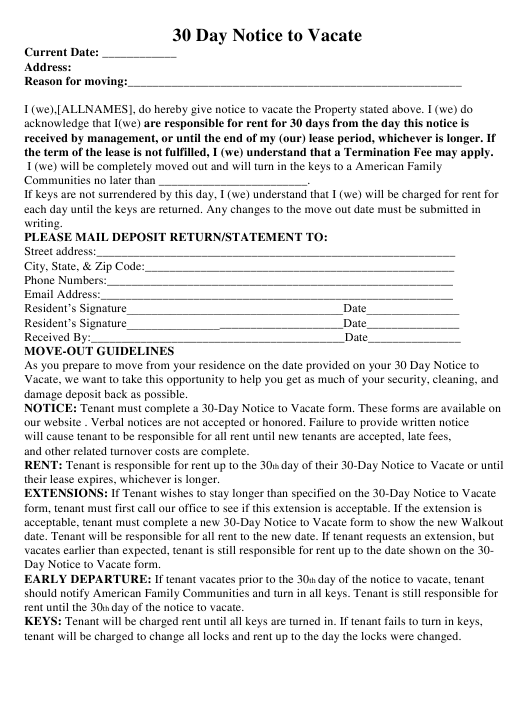 Day Notice to Vacate form. day of the notice to vacate. tenant will be charged to change all locks and rent up to the day the locks were changed. representative to perform the inspection. tenant’s expense. Note: Cleaning is $25.00 per hour and maintenance is $55.00 per hour. tenants follow the Move-Out Inspection procedures and checklist. placed in walls by the tenant), unless otherwise noted on the Move-In Inspection Sheet. bulbs, smoke detector batteries, appliance light bulbs, and furnace filters upon their move out. The cost to replace them will be at the tenant’s expense. 1. Clean from room to room. 2. Clean top to bottom. Clean ceiling, then light fixtures, then window & blinds, walls, and the floors last. 3. Use Pledge or Old English Polish on wood cabinets after you have cleaned them with pine-sol/water solution. 4. Vacuum out drawers and cabinets first, and then wash them out with pine-sol & water solution. 5. Wash metal floor vents in dishwasher first, and then use pine-sol/water solution to wipe them out. 6. Use a dry toothbrush to clean switches, outlets, phone & cabinet jack crevices, and dust all blinds. 7. Use Pine-sol with warm water to wash down 90% of the interior. 8. Use soft scrub and a toothbrush to clean around faucet handles. free mirror finish on chrome. 10. Use Pumice stone to remove stains in toilets. 11. Vacuum window & patio door tracks, then use solution with toothbrush to clean well. 12. Vacuum carpets & treat stains. oven cleaner. This may take several attempts. 14. Use degreaser and a scrub brush to remove oil from driveway, garage, and storage. 15. Roll the refrigerator out and clean behind/underneath; pull out stove drawer to clean underneath. 16. Goo-B-Gone works to remove gum & stickers. 18. Mow lawn and remove any weeds from flower beds.